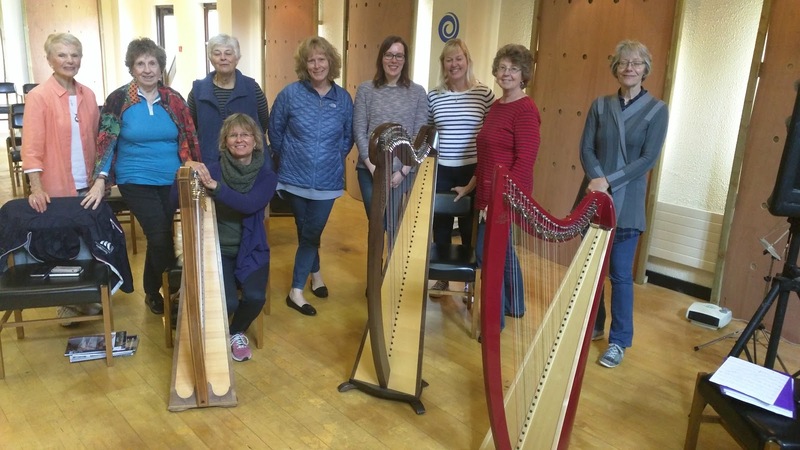 Eight harp players, a friend, a daughter of a harpist and two golfers trickle into the West Port Hotel in the Scottish country town of Linlithgow one day in early June. Plus the group leader and world class harpist, Sunita Staneslow - and myself. The golfers deposit their collection of clubs at my sister Helen’s house nearby, having satisfied their craving for the game prior to meeting us. One of the group flew in from Australia (a harp player who also brought her fiddle). The rest were an even split from Canada and the USA. 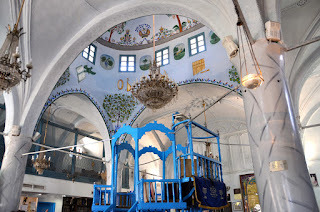 We had arrived from Tel Aviv just a few days before. An unusual mix, yet strangely compatible in part because we all share a love of music. We meld and bond together during the tour. Most of the tour group have either been on other harp tours with Sunita or taken her harp workshops in the US or Canada. The group is a bit tentative at first but a nice camaraderie evolves over the course of the trip as shared experiences cement a bond. These include a whirlwind of harp lessons, shared accommodations, castles, walking tours, some wet squishy weather, pubs, fish & chips, meeting locals, and of course lots of music. The weather overall is surprisingly mild and warm for Scotland. 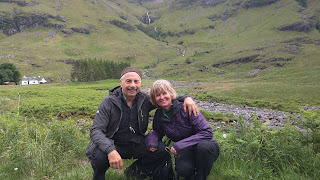 Our route follows part of the 18-week tandem cycling tour Sunita and I took around Europe two years earlier. Now we are back in Scotland sans bicycle, but with this gaggle of harpists in tow. Lots of fun. morning taking care of some business and ordering a new bespoke kilt, then rejoin the group with local harpists Corrina and Heather for a festive lunch. Alison Kinnaird’s harp and glass studio was another highlight, as was the visit to the the harp pavilion at the Edinburgh Botanical Gardens. A fully functional harp/sculpture had been created by master harp builder, Mark Norris, from an old Elm tree that succumbed to the disease that had swept the country. A fine exhibit. 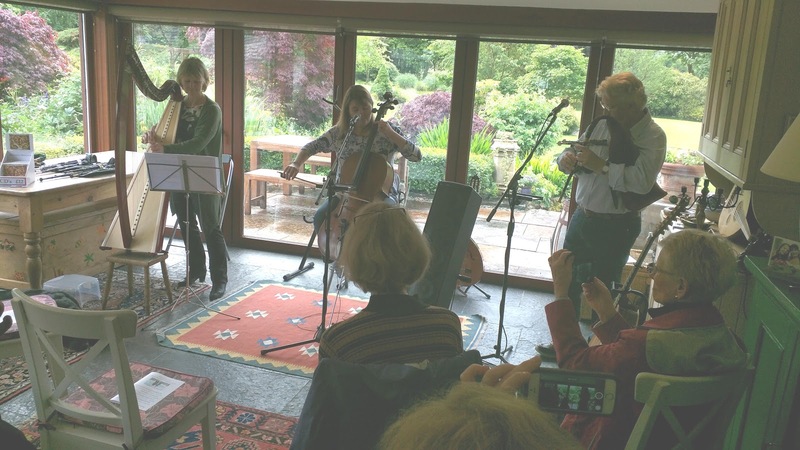 A garden party at Helen’s Linlithgow home is a great place to kick off the tour, complete with piper, session musicians and storytellers, and an eclectic mix of local personas. Husband David is on top form, providing exotic bar-b-q, vegan options, and Scottish craft beer. I wear my kilt. music are much appreciated. They meld together an unusual but sublime combination of cello, guitar and voice. Sunita joins with harp for a couple of tunes. After concert and tea, we stroll through their estate, with formal gardens, woodlands, bog, field, and rugged shoreline. A classic Scottish experience. 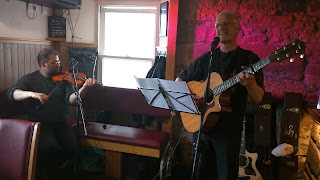 music and fun at Fiddlers Pub, where her friend Tim Pomeroy is performing. 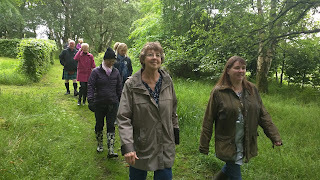 Arran also provides a distillery tour and a hike through the heath in driving rain to the Machrie Moor standing stones. Our hikers are quite proud (as they should be) of their determination and stamina. 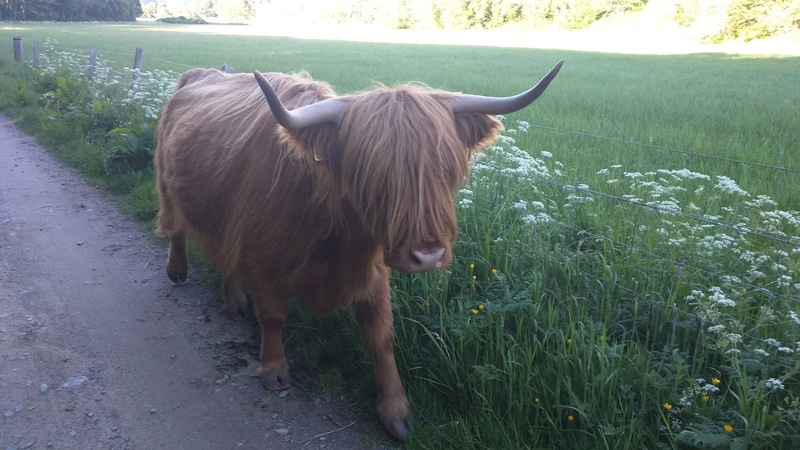 Only Susan travels with her Wellington Boots and returns with dry feet. After departing Arran by ferry en route to Loch Ness we visit Davie the harp maker at Starfish Designs in North Ballachulish. Very fine boutique instruments. munching at succulent grasses that grow along the edge of woodland and meadow. The cows are the hobby of Carl, our grizzled cigar chomping host. We visit Urquart Castle on the shore of the Loch, an amazing edifice that was the site of many a bloody battle. Then, past Inverness to Dunrobin Castle, the seat of the Duke of Sutherland, a notorious oppressor of the Scottish folk in the region. The Highland Clearance site at Badbea was shocking - a windswept bit of tundra-like land sloping down to a particularly rugged bit of coastline on the North Sea. The Scottish peasantry that were forcibly transferred there in the 18th and 19th centuries did not fare well. The infertile land yields little no matter how much toil is invested. 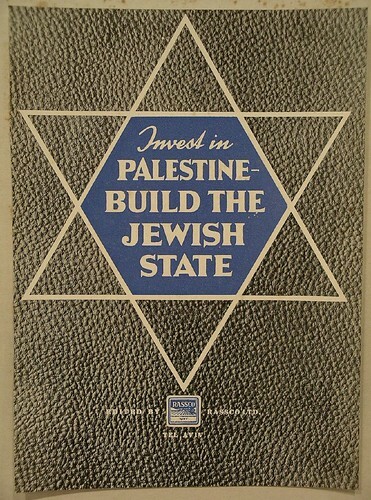 I mull over a comparison of the local politics of two hundred years ago, and todays dynamic back home in Israel/Palestine. Not much difference. In the far north, Caithness proves to be an edge community, situated at the confluence of Celtic culture and Nordic influence. Many local people reject the Gaelic revival that is gaining traction in the rest of Scotland, since the language is not native to the north. A local resident tells us that there’s much resentment at recent introduction of Gaelic into the children’s classrooms. “Those damn SNP busybodies”, as he put it. Countryfolk and farmers alike, tend to affiliate more with the Viking heritage of the nearby Isle of Orkney, than the English-dominated lands to the south. 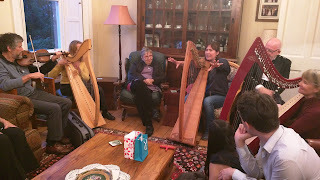 Sunita gives some harp classes, then performs in the salon in the evening for our group and the house guests. Tom sings a song. I have an early night. Graham the Gardener takes us on a walking tour of the estate. His deep knowledge and articulate delivery are much appreciated. Graham took over as groundskeeper on the neglected estate just eighteen months before, and is painstakingly restoring it’s faded splendour. I find the walled garden particularly interesting since I enjoy organic gardening at home and Graham’s techniques are similar, allowing for the difference in latitude, climate and soil. The ferry to the Isle of Orkney takes less than an hour. We are met by local personage, Stuart Roy Maciver, who escorts us to visit Skara Brae, a restored Neolithic village, and then to the The Ring of Brodgar, a large collection of monolithic standing stones in a perfect circle. In the evening we attend a music session at The Reel, a pub/music centre in Kirkwall, where local and visiting musicians get together for lively jam sessions. 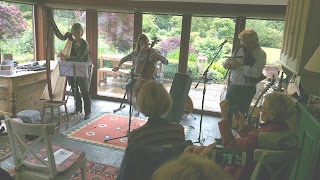 Sunita joined the musicians’ circle with the harp and Christine joined on fiddle. It was a grand evening. We board the overnight Northlink ferry to Shetland. The sea is thankfully calm. Everyone gets a good night’s sleep and is ready for the next day. On arrival in Lerwick, Shetland, we were met by Les Sinclair, a scion of an ancient Viking family whose heritage goes back hundreds of years into the mists of time. 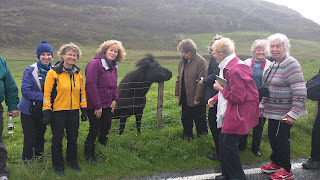 We were regaled with tales of the isles while travelling north through the main island, past hilly tundra-like landscape, pausing here and there to visit with miniature Shetland ponies and gasp at the grandeur of the the stunning Wormadale cliffs along the west coast the main Island. We visit the castle at Scalloway and the Viking Parliament at Tingwall. An ancient, awesome land. We pause at a monument to the Shetland Bus. Norwegian’s and Shetland sailors shuttled spies and money across the waters between Shetland and Noway in WW11. The Mercedes coach that is with us from the tour start to finish, is driven by our driver Richard, who navigates the narrow Island roads with patience and skill. It takes two more short ferry rides to arrive at the northern Island of Unst, and our final destination at Saxa Vord. It’s an old airforce base converted to a funky resort and staffed by an eclectic mix of locals, ex air force pals of the owner. It provides fun jobs for the summer for young men and women from all over Europe. We are almost off the map at the most northern place in the UK. The very definition of ‘off the beaten track’. We are now deep into the Nordic influenced society of the islands. The Viking spirit runs deep, evidenced by the many festivals and events highlighting their heritage. No kilts, bagpipes or other icons of Scottish Gaelic culture to be seen. Crafts and music have relationships with styles seen in Oslo rather than Glasgow, despite Shetland being bonded for centuries to Scotland and the British Isles. Sunita gives harp seminars. I take non-harpists hiking to Muckle Flugga. We visit the gin distillery, and on the last evening produce a harp and fiddle concert to a packed hall at Saxa Vord. Sunita introduces world class harp playing to a riveted audience of mostly local residents. 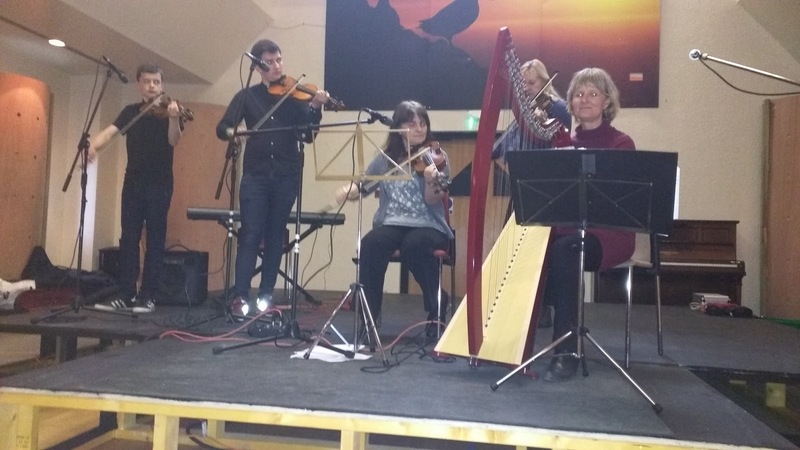 Over the past six months she had been in touch with 3 local fiddlers and a local harpist. Together they crafted a diverse and entertaining programme for the evening. Our own Christine also joined on fiddle. For weeks, Green Olive marketing wizzkid, Mutasem has been promoting the concert through FaceBook and Google. Kirsty, our local organiser, pounded the pavements putting up posters on almost every bus stop on the islands. It all paid off. The audience swelled to a capacity house of close to 100 people. The electricity died just before the start of the event, so we lighted the stage with our Green Olive solar lanterns, and the musicians played acoustically until the power returned towards the end of the concert. It was a fine evening and worth all the effort. We raised over £400 for the local Heritage Trust. The tour winds down. Sunita and I see the group off on the ferry to Aberdeen, in the care of Richard. 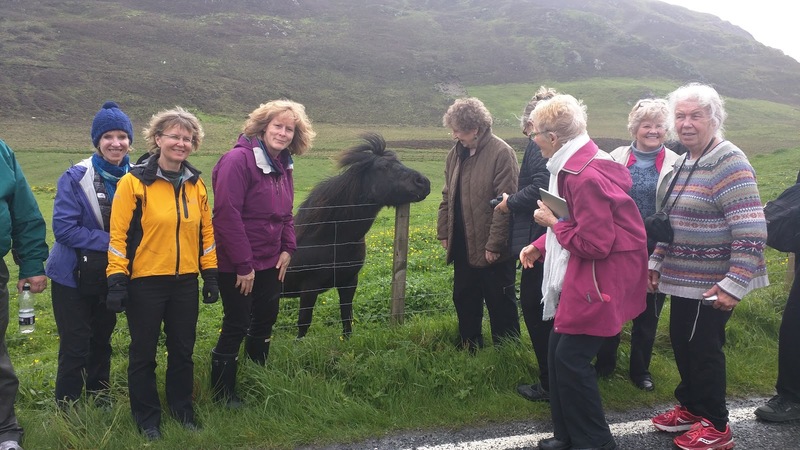 We stay a few extra days in Shetland for some R&R and business meetings to set the stage for next year’s tour. We relax. In the meanwhile the group continues south from Aberdeen, seeing more of the Scottish highlands and making a pit stop in Dundee. Sunita’s harp is delivered safely back to Helen’s house where Tom and Jill picked up their golf clubs and are dropped at the Linlithgow station for a train to Glasgow. Most of the rest of the crew are dropped off at the elegant Rutland Hotel in Edinburgh’s West End. The tour concludes with everyone happy and filled with lasting memories. Fred Schlomka was born and raised in Edinburgh and is CEO at Green Olive Tours. 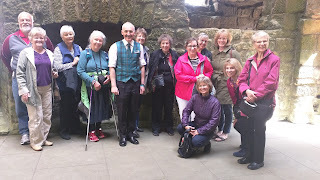 He accompanied the group leader, his wife and partner Sunita Staneslow, on the Scottish tour. They live most of the year at their urban homestead on the beach in Jaffa. Sunita spends her time performing & teaching around the world, leading harp tours, recording, and writing books of harp arrangements. She also works one day a week as a Therapeutic Musician at Schneider Children's hospital in Petah Tikvah. - www.sunitaharp.com.